I have participated in the Rainbow Scrap Challenge this year and one of the projects that I worked on was hand appliqued Orange Peel blocks. Septembers’ color was rose with a touch of gold….I’d appliqued six peels, and then in early October I made two more to have a two-block finish. Then I worked on two more for October. October’s color is yellow. I plan on making two more yellow blocks to finish the row but I may put that off for another month. The butterfly is almost done being echo quilted, then I’ll draw more lines. The butterfly is the last element in this row. 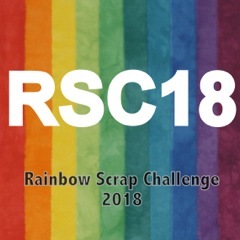 To see what other Rainbow projects are going on, head on over to So Scrappy on Saturdays. Slow Stitching projects are always enjoyable over at Kathy’s Quilts on Sundays. Tagged Applique, hand quilting, orange peel quilt blocks, Rainbow Scrap challenge, Stars and Spools. Bookmark the permalink. I wondered how long at 35 degree nights (or close to that number) before you would relent and turn on the heat to chase the chill out. I’m afraid if my inside temp goes below 66 I would turn my heat on to get the chill out right away – I can’t take the cold too well. I love that quilt – it is turning out really well!! Finally turned our heat on this week. You stay so busy with your beautiful sewing projects! Your Orange Peel quilt is coming along beautifully! Hope you find time to get some more stitching in this week. I love your orange peels! Your quilting is lovely and colorful. Once again, our weather sounds just like yours. My furnace is still set to AC mode, but the past week made me think it was time to change it over! And switch the bed sheets over to flannel as well! Your orange peels are so vibrant – as always, row after row of interesting fabrics and colors to feast your eyes upon! Our summer seems to be hanging on as well! We’re due for 90s tomorrow. The set of orange and yellow orange peels will be a nice addition to your other colors! Your Orange Peel is SEW appealing!! It is going to have to go on my RSC17 list of potential projects. We’ve been having light frosts and now it is going to be 80 degrees on Tuesday. The plants must be as confused as we are with the vast swings. Your orange peels are lovely in the colors. The yellow really will add a good touch. Your hand quilting and the Appliques are so darling. A really fine job. I absolutely love the orange peel quilt. It will be fabulous when you get finished. Your orange peels are lovely. Glad the flowers are still out for your and hopefully a little warmer this week will allow for some restful hand quilting for you! Our fall color is delayed too, we should be coming up on our peak next weekend, but it now looks like that will not be until November. I am always in awe of your hand quilting. The colour change is starting here in southern Ontario but not at peak yet. We have had a couple of frosty mornings but many days, it is quite warm in the afternoon. I have not even put away my sandals yet! I always enjoy seeing your lovely projects each week! Beautiful hand quilting. This is going to be a stunning quilt. I’ve had to add another quilt on top of my bed at night. Leaves are beginning to turn a tiny bit. I’m guessing there will be a big change in a few weeks. I love the way that you are quilting that border. Your orange peels are all quite pretty. We are supposed to get temps near the 80s here this week. Not much foliage change here either. Every time I see your orange peels I tell myself I really should finish mine. So far, no luck. Lol. We got rain today! I’m sorry you had to turn on the heat but I know you much prefer that to the temps we are going to get yet again. Supposed to hit 90 by Wednesday — but today we got rain. I swear the grass was doing a happy dance! What a wonderful post, this one and the following one both. Beautiful fall, beautiful quilting. Love the orange peels. I can’t believe it’s so cold there. Even when our high on Friday only hits 60 (after 80s all week! ), the low will be almost ten degrees higher than your low that morning! I hope you have a few more beautiful days before the cold really sets in. Oh your hand appliqué is stunning! I have done the orange peel with machine stitching…so I am extra impressed with yours! Great job…. Again, I’m so in love with your Orange Peel Quilt! It’s so lovely – I lost myself for a bit just staring and admiring it! My sister-in-law lives in PA, about 20 min. from Maryland. She has also commented on your strange fall weather. Here in NM, we’re still in shorts and sandals and able to enjoy tomatoes off the vine. Honestly though, your work is lovely. Thank you so much for sharing! I just love your peels! I really like how you made the occasional background a dark colour of the month… wish I had thought of that! Hope you are enjoying your hand quilting!